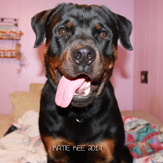 CAs won't show up on your AKC page until they have the title - the certificate will be automaticly mailed to you. I just emailed them about V's title. The CAT stuff is all entered manually so it seems to take longer. It will not list the legs like it does for agility or obedience. It's taken over a month for Ilka's obedience and rally legs to show up sometimes. I'm on tenterhooks, waiting to see Leo's name show up. I mean, I only mailed the application a a week ago today. Right! It's not like they have millions of other dog's records to update! Don't they KNOW that Siri and Ilka are damn important?!?!??? Don't worry...I've already got this figured out. It will update sometime around Sunday evening just to tide me over for the 3 month wait it will take to update her last leg and get her title certificate. Crap. Do they send a title certificate for the CA even? I sure hope so! Well..that settles that. At least I know not to check it obsessively until AFTER this weekend! And yay for a certificate! Updated event list. http://classic.akc.org/pdfs/events/c...ing_Events.pdf I'm hoping to get to the one in Brenham. I'm thinking about the one in Brenham too since it's close. Oh I like the addition of the one in Indianapolis! Only three hours from me. Anyone else? Ok, another question. Event Numbers: 20136844CA1-CA4, does this mean there are four events that weekend? So I could potentially knock out four legs? YES it is - I emailed the secretary, it is indeed FOUR cat tests in one weekend. I have no plans for that weekend yet. It's only... oh shoot, 7hrs away. Looking for a co-pilot now. Holy cow, that'll be legs # 11-14 for Kaylee. That'll leave only 9 legs to get in 2014 for her CAX. WOW!!!!! Last edited by Sizzledog; 03-26-2013 at 05:16 PM. Thanks for clarifying! I felt bad asking so many questions. I will enter as soon as its up! Hopefully we can get the CA in one weekend. The premium has been released for the Indy CAT in June. Thank you for this thread! We've entered Khaleesi in her first coursing event next month near Nashville and we have a lot to learn. I'm was a tad worried about Khaleesi and us having NO idea what to do...this has given me some confidence. Printed off the paperwork! I could have sworn they changed the dates...they were originally June 1st and 2nd??? Yep they still are - they have regular lure coursing the 15-16th, were you perhaps looking at that event? Lifesaver! I felt like the paperwork seemed weird but had never done it before. Yep. I was looking at the wrong one. 2 more days until Siri tries the CAT for the 3rd leg! I'm already getting excited! Woohoo! Good luck! We demand pictures, haha! Ha! Pictures will definitely be posted. I'm hoping for video too...but we shall see. Also hoping it doesn't rain! Stay away rain! I'm looking forward to Ilka getting her first two legs this weekend. Man, if I had been able to make all the ones I wanted to, but had to miss for some reason or another, she'd have her CAA by now. It's very annoying that life so frequently gets in the way of you doing what you want. Story of my life, girl! Damn having responsibilities! There's currently only one listed, but they update the list when new events are approved. Last edited by Rosemary; 03-28-2013 at 05:34 PM. 3 in one weekend! Lucky NC peeps! That's a title if they run all 3! This look like so much fun! I checked into my area, and there is a test April 27th and 28th right near home! I am definitely going to watch! We have never tried this, but would love to. Too bad we never have, or I would enter Ruger! I will try to find out where we can do fun runs from the place that is putting on the testing end of April. I think he would chase anything until he dropped from exhaustion! Well, I think we can safely say that Ilka likes lure coursing. Thank you Dobiewankenobi for the great action photos. Last edited by Rosemary; 03-31-2013 at 08:40 PM. Reason: photobucket is being hateful again. These are from today. No action shots, but she gets to show off her pretty ribbons.